Nine people have been jailed for a total of 33 years for supplying Class A drugs in Norwich. Four people appeared at Norwich Crown Court yesterday (Thursday 6 September 2018) whilst a further seven appeared at Norwich Crown Court today (Friday 7 September) charged in connection with various offences in relation to the supply of heroin and crack cocaine in the city. 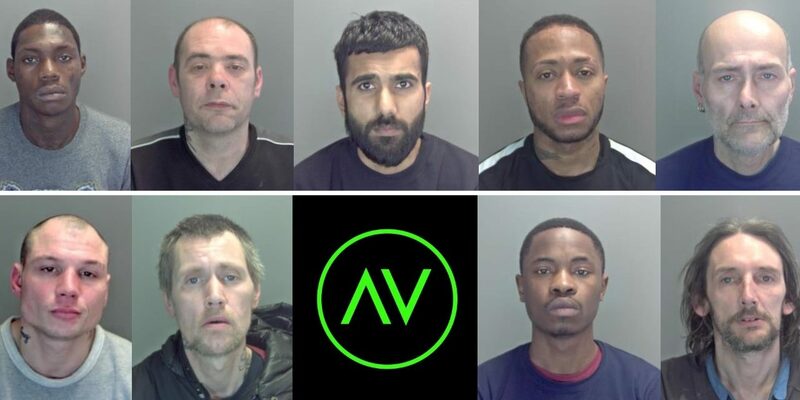 Nine people were jailed and another two given suspended prison sentences following Operation Granary in April 2018 which saw officers from the Norfolk Serious and Organised Crime Unit take part in two weeks of action under Operation Gravity – Norfolk Constabulary’s overarching campaign tackling Class A drug dealing in the county. Detective Sergeant Matt Barden said: “These jail sentences are the culmination of months of investigations carried out by our officers and as a result we have been able to significantly disrupt the activity of those intent on supplying Class A drugs in Norwich. Ali Khan, aged 26 and from Romford Road in London, was sentenced to four years in prison for conspiring to supply – and the supply of – heroin and crack cocaine between Monday 8 January and Monday 19 March 2018. Manley Vidal, aged 26 and of Barnards Yard in Norwich, was sentenced to four years and three months in prison for conspiring to supply – and the supply of – heroin and crack cocaine between Monday 13 November 2017 and Sunday 4 March 2018. Mark Wheatland, aged 53 and of Wellington Green in Norwich, was sentenced to five years eight months in prison for conspiring to supply – and the supply of – heroin and crack cocaine between Monday 13 November 2017 and Sunday 4 March 2018. Richard Law, aged 43 and of Northumberland Street in Norwich, was sentenced to 30 months in prison for conspiring to supply – and the supply of – heroin and crack cocaine between Monday 13 November 2017 and Sunday 4 March 2018. Neil Brewster, aged 36 and of no fixed address, was sentenced to three years in prison for conspiring to supply – and the supply of – heroin and crack cocaine between Monday 13 November 2017 and Sunday 4 March 2018. Gary Carver, aged 46 and of Magdalen Street in Norwich, was sentenced to 30 months in prison for conspiring to supply – and the supply of – heroin and crack cocaine between Tuesday 20 February 2018 and Monday 12 March 2018. Rufin Kongolo, aged 33 and of Constitution Hill in Norwich, was sentenced to five years in prison for conspiring to supply – and the supply of – heroin and crack cocaine between Tuesday 14 November 2017 and Friday 23 March 2018. Blaizy Katindi, aged 28 and of Fishergate in Norwich, was sentenced to four years in prison for conspiring to supply – and the supply of – heroin and crack cocaine between Tuesday 14 November 2017 and Friday 20 April 2018. Ben Matthews, aged 43 and of Cowgate in Norwich, was sentenced to 28 months in prison for the supply of a Class A drug on Wednesday 20 December 2017. Katherine Birch, aged 40 and of Rosary Road in Norwich, was given a 22 month suspended prison sentence for the supply of a class A drug on Wednesday 21 March 2018. Michelle Clarke, aged 48 and from Penn Grove in Norwich, was given a two year suspended prison sentence for Class A drug offences between Sunday 7 January and Tuesday 20 March 2018.